Lotus Blossom Tank KAL: Finished and Fresh from the Dryer! I finished! And I even wore it to work on Wednesday (with some discreet pinning of the appropriate bra). 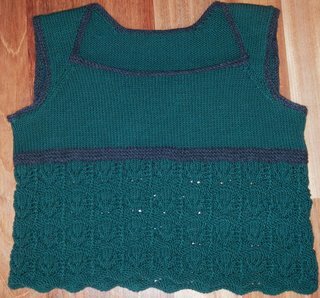 I had some problems with the blocking: I wanted to tighten up the back, the armholes, and the curled-outward neckline. No luck: I got it wet and it grew by 10 inches in width and about a foot in length. It went into the dryer and was fried back to it's pre-wash size. 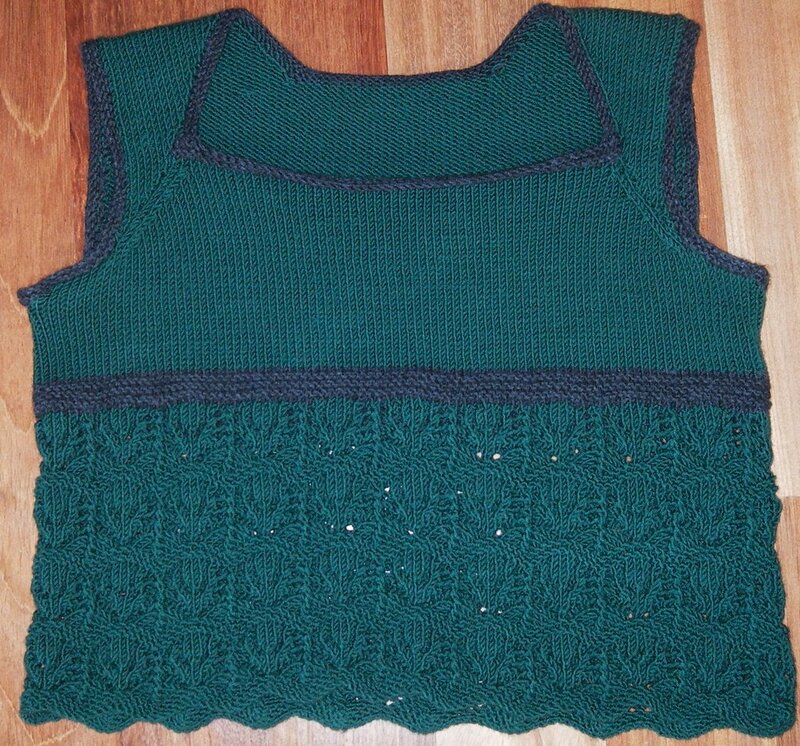 To all you bamboo users freaking out about your sizing after reading this: Relax: I knit this with Filatura Di Crosa Zara Merino in green and grey (ran out of green) so I shall be alone in my blocking issues. Overall, I had a great time with this pattern, and I look forward to wearing this tank, and seeing all of your finished photos! Thanks for the inspiration, company, support, and advice! wow! I love the contrasting colour! If I ever knit this again I think I'd do the same thing. Yes - I knit a scarf in that same yarn and was shocked and horrified by how much it grew when it was wet. I didn't realize it could be thrown in the dryer! Good to know. The contrasting band is great, and it looks like it's normal-sized again! I agree with sophie, if I knit another one, it'll have at least one band of contrasting color. I too like how the contrasting band worked out for you.